In order to live a comfortable life in retirement, millions of Americans sacrifice now by putting money into their 401K and other retirement plans. One question to consider is: What good is it to have this nest egg when my hips and back hurt so badly that I can’t enjoy it? Like a financial plan, ensuring a future without low back pain and activity restrictions requires regular and consistent diligence. This article outlines an exercise program that is simple and easily done at home – without requiring exercise equipment or access to a gym or fitness facility. The following are some stretches that aid in pain relief by helping take stress off the low back and hips and may greatly reduce the advancement of arthritis in the spine. These back exercises should be performed in a pain free manner. If pain is experienced, it is best to discontinue the exercises and consider being evaluated by a licensed physical therapist that specializes in treatment of the spine. If one already has low back pain or other health condition, it is advisable to first be evaluated by a physician and, as appropriate, receive guidance on how to do the following exercises by a spine specialist. The piriformis muscle runs from the back of the femur (thigh bone) to the sacrum (base of the spine). Tightness in this muscle has been linked to sacroiliac joint dysfunction and even sciatica-type pain along the sciatic nerve. To stretch the piriformis, lie on your back and cross the involved leg over the other . With both knees bent, place both hands together under the knee of the other leg (the lower leg), and gently pull the bottom leg toward your chest and hold both thighs closely until a stretch is felt in the buttock area. The Psoas Major muscle attaches to the front portion of the lower spine (from thoracic segment 12 through lumbar segment 5) and can greatly limit low back mobility when tight. It often is one of the sources of low back pain in patients who have difficulty standing for extended periods or kneeling on both knees. 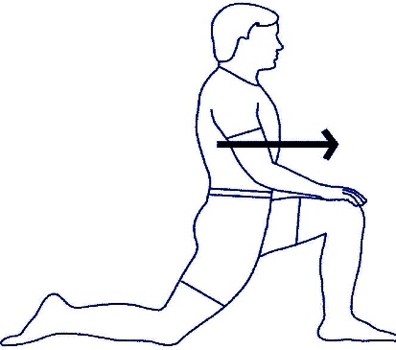 This muscle can be stretched in a half kneeling position (kneeling on one knee). Rotate the leg outward and tighten the gluteal muscles on the side you’re stretching. Next, lean forward through the hip joint rather then bending through the lumbar spine. A stretch should be felt in the front of the hip that the patient is kneeling on. The hamstrings run from the back of the ishial tuberosity (pelvic bone) to just below the back of the knee. They are responsible for bending the knee and assisting the gluteal muscles to extend the hip. These muscles are very important to stretch because, when tight, they make it nearly impossible to sit up straight. People who do not sit with an erect posture run the risk of early onset of degenerative disc disease and other back problems. Tight hamstring muscles are closely associated with low back pain. One way to gently stretch hamstring muscles is to lie on the back and grasp the leg behind the knee with the hip flexed to 90 degrees and the knee bent. Attempt to straighten the knee with the toes pointed back toward you. Many people think of performing abdominal crunches or situps to strengthen the abdominal muscles. While “six pack abs” look nice to some, it is more important to work the Transversus Abdominis (TVA) through abdominal exercise to achieve spinal stability. When retraining the TVA, it is important to maintain a neutral lumbar spine (don’t try pushing the back all the way into the floor). The back is most often in a neutral spine position, so it makes less sense to strengthen the back in a flexed or extended position. Lie on one’s back with the knees bent. Knees and feet should be shoulder width apart. Draw the belly button toward the spine while maintaining a neutral spine. Upon exhalation, reach toward the ceiling as if trying to grab a trapeze overhead. Then raise the head and shoulders off the floor, just to the point where the shoulder blades are barely touching the floor, and hold 1-2 seconds. Inhale upon return and repeat at the end of the next exhalation. Continue until it is not possible to maintain a neutral spine or when fatigued.